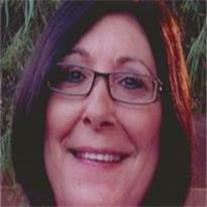 56, of Mesa, Arizona passed away peacefully at home on June 26, 2011. Donna’s beloved family includes her husband Dan, son Brian Germer, stepsons and spouses Trent and Sarah, Kyle and Ashley, and Adam Bevier, her father Anton Kimmerle, brother and wife Brian and Kerry Kimmerle and sisters Carole and Lisa. Donna’s moon and stars were her six grandchildren, Brendan and Madelyn Germer, Aiden and Anna Bevier, Jackson and McKenna Bevier. She was preceded in death by her mother Roberta Kimmerle. Donna grew up in the cradle of love and friendship of her parents, brother and sisters, cousins and friends in Dumont, NJ. She lived her life with passion, grace and class. Her life is defined by her love, loyalty and dedication to her family. Her grandkids knew if they weren’t getting the answer they wanted from their parents, it was time to check with Granny. Donna spent 30 years working at Salt River Project and her co-workers and friends countless offers of help sympathy and support are appreciated by her family. In lieu of flowers the family suggests donations to the Susan G. Komen Breast Cancer Fund in memory of Roberta Kimmerle.